Important Electoral News: Vote La Lengua! 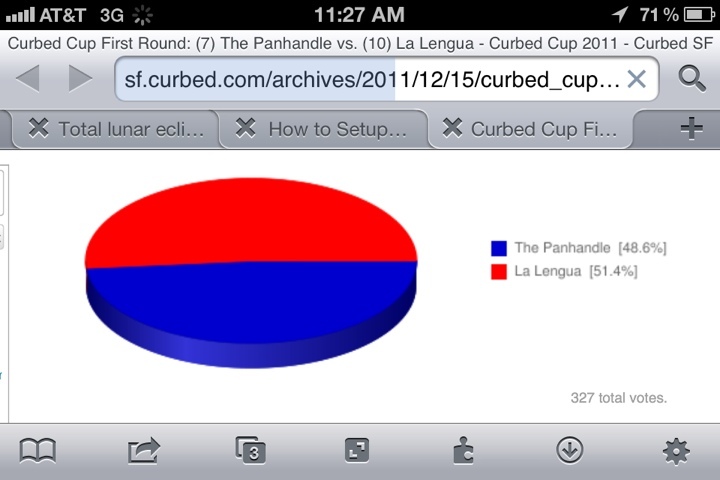 The LaLeVoElCo (La Lengua Voting and Electoral Commission) has learned that CurbedSF has gloriously included La Lengua in the Curbed Cup, the yearly neighborhood-off. Our competition in the first round is the evilly compressed NoPa, aka Pandhandle. Do take the time to vote for our beloved wedge-shaped neighborhood. UPDATE: Your efforts were successful! We narrowly defeated the NoPanditos, 51.4% to 48.6%! Russian Hill is next. If we get past them, and if Potrero succumbs to Bernal in the War of the Hill People, a battle royale will ensue in the lowlands. Just say No to NoPa! VIVA LA LENGUA LIBRE ¡VOTAR! ¡VOTAR! ¡VOTAR!